Mum and Dad arrived armed with loads of wood and a pump-up sprayer, which was immediately put to good use in spraying the aphid-covered cabbages with Sybol. Also sprayed the pepper, which was suffering similarly. Allotment not too bad as it was cloudy most of the day. Picked a pile of the broad beans. Fed Dad some of the gooseberries, crumbled. Day off to get those niggling jobs done while Dad made a new gate. All of us went up to the allotment and M&D picked 4-odd lbs of gooseberries to take home, the rest of the broad beans (which I can now cut down) and some more blackcurrants. None of the seeds are up yet, though I have high hopes of the romaine lettuce soon as the netted bed ones are up. I wish some would, so I know where on earth the rows are! French beans now setting (finally) though not very many! Cabbages need bigger nets desperately. Where's the flipping rain?! Still not reaching us despite forecast saying rain for the next 5 days! Argh! Still need to plant the broccoli but not until the soil is a bit softer… Discovered why the gooseberry bushes aren't all fruiting - the blind ones were probably very heavily pruned back, which is according to the RHS Advisory about the only thing that will stop them fruiting. Thinking about it, the branches do appear very young. Blackcurrants should have 1/3 of the branches removed each year, but not until winter. Went up to the allotment, with a black cloud looming and fork lightning playing on the horizon, but not apparently getting any closer, sadly. Something has been digging my seed beds again - think I can forget the carrots at the downhill side! Watered everything bar the onions. My latest set of French beans (the ones planted straight into the soil) are up, as are a few of the beetroot (phew). Leeks doing very nicely, having grown another 6" or so. Need to get a few canes and do the water bottle thing as a deterrant. Up to allot while purportedly taping GW (which didn't - good old pdc) and watered stuff. Agreed with another chap that neither of us trusted the weather forecast enough to leave stuff unwatered. Beetroot nicely coming up now, as are the romaines. No sign of the carrots. Not that the wildlife has helped much there. No surprise there, then. They're the Unwin's Nantes. Must get some Sutton's. Leeks growing well (and must plant out the ones at home as they are now at the same stage the others were when I planted them). Bought more early carrot seed; this time one bannered as a ‘true Autumn sowing carrot' with RHS commendation (but not AGM…). Looks like it's sowable right through to October and will grow overwinter. Evening murky to say the least, but promising rain. Went to the allotment after work, armed with a pile of stuff to do. Lots of little carrots up now, and fortunately nothing else has tried to dig to Australia in the middle of the rows. Weeded the beans and the leeks, and watered stuff as I went along. Tried to bash a hole in the firebox but it wasn't having any of it. Hand drill next… Glad I bought it now! Planted the second lot of leek seedlings in one of the rabbit craters and more in a parallel row to the first lot. First lot are ‘verina', which I'd not seen before, and have absolutely no idea when they'll be ready! Since they're about the only things I've got in at the correct time, they may be ready by autumn. Yum. Didn't plant any of the new carrot seed, as they look like they'll manage being sown a bit later for succession. 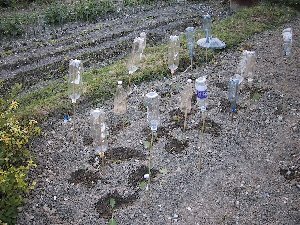 Did plant broccoli at last, though with a lot of plastic bottles for pigeon proofing. Think that I'll have to import string and old CDs as well, as I can hardly net something that gets to 2' high. Picked a fair few blackcurrants, which are well and truly ripe now, as are the gooseberries. Fought my way into those and got well scratched for my trouble, but have 2lbs of gooseberries even I can eat without sugar. Amazing. Blackberry now on the warpath, and getting very prickly… And some windfall apples. After the forecast, I expect more this week, then I feel a crumble coming on! Even the French beans are looking happy at last. Left the hammer at the allotment. Got out to the allotment on a day when the soil was nice and damp so finally got the digging finished! Raked the bed flat, and so now all I have to do is decide what to put there. I think it's going to be more brassicas, probably the spring cabbages. Weeded/hoed a fair few unwelcome visitors, and risked digging up a couple of potato plants. I think they're King Edwards - pink blotches and all - and though not huge tubers, were quite decent. There's a meal :-) The carrots are growing their second leaves, as are the beetroot. Lettuces already galloping. Got some French beans off as well! Marrow flowering, though still tiny, and the leeks are still looking good. The onions are the biggest surprise - seem to have shot up in size in the last week alone, though given the amount of rain it's not too unexpected. Very glad - need some decent bulbs to last the winter. Looks to me like the poorly growing ones are the ones which are nearer to the forsythia and the large apple tree, so they are probably suffering from the roots. Noticed a teazel growing up through the top apple tree, and I've finally worked out which is the russet - it's the smallish one in the middle of the block. The apples on it are going fuzzy. Very hot again, so couldn't really go up to the allotment until it cooled off. Was pleased to find everything still upright, and the seedlings growing very nicely now. 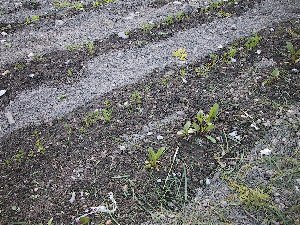 The beetroot is going very well, and I'm going to have to work out if I can thin them into another row to avoid wasting them. Carrots are growing tufty leaves now and so it's easier to work out where they are. Not necessarily in the row! The lettuces are behind those at home but not bad. They'll need thinning soon as well. Not to mention slug baiting. The French beans are finally looking right. There's still a large spread of sizes of plant but several are loaded with flowers. They really needed that rain. Onions getting bigger, and one marrow has a female a few days from flowering. The other one seems to have collapsed. The pigeons have only eaten one broccoli plant: put up more bottle scarers anyway. Watered both heavily. Strimmed the grass until the batteries gave out, and had another set-to with the beastly gooseberry. This time there was considerable blood. Last lot I think, as they're so ripe now that they're exploding on the plants. Traded a few with Chris, who had lots of yellow courgettes. 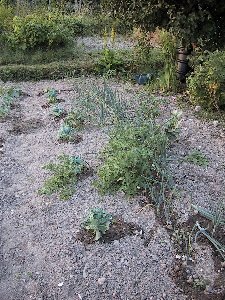 what was a row of neat onions - and now has been taken over by quatermass tomatoes! 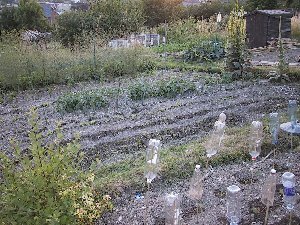 Went up to the allotment about 8pm and watered everything now the heatwave's back. Got given a marrow by Lee on the next plot via Jim. I wish I could give stuff back, but nothing's big enough! I think I'll have takers when the apples ripen though. More baking heat, around 30oC. Didn't get to allot until gone 9pm and it was still hot. Stuff looks good for all that. Soaked the seedlings, which are rapidly turning into decent little plants. Going to have to thin them/transplant them soon. Incredibly hot. Went up to the allotment at about 8 and drowned everything I could. Some of the onions are starting to look like they are ripening - the skins are turning. Not quite as hot thank goodness. Allotment survived not being drowned yesterday, and lettuces are going to need serious thinning soon. So are the beetroot. Weeds still outgrowing everything else. Marrow flowered yesterday and pollen beetles got all the pollen off the males, so hoping the female did get fertilised.